Culpepper Connections Note: The specific Culpeper who built the house is unknown, but he may have been of the Bedgebury line and probably built it in the 16th century. Sir George Harper and Thomas Culpeper, were half-brothers, the sons of Constantia Chamberlayn, who married first, Sir Alexander Culpeper9b of Bedgebury and Hardreshull, and second, Richard Harper. In March 2000, no home named Britains could be located by Culpepper Connections, but Great Britain’s Wood is traversed by the A-21 on the south side of Sevenoaks. Location: On the A-21, about 2 miles S of where the M-25 changes into the A-21. John, duke of Northumberland, made a lease of Whitley Forest (alias Whitcliff Wood) in Sevenoaks to Sir George Harper and Thomas Culpeper10b, Esq., who granted their interest in them to Christopher Roper. (Hasted Volume III, page 70). Sir George Harper and Thomas Culpeper, were half-brothers, the sons of Constantia Chamberlayn, who married first, Sir Alexander Culpeper9b of Bedgebury and Hardreshull, and second, Richard Harper. Note, also, that Sir Alexander was the grandson of Walter Culpeper7b and Agnes Roper, and Agnes was the daughter of Edmund Roper of St. Dunstan’s Canterbury. Christopher Roper, to whom the above lands were granted, was presumably a member of this Roper family. Location: On east side of the B-2042, 2 mile S of its intersection with the A-25. More research needed to see if any Culpepers were involved in this parish. Location: On the A-25, just south of the M-26, 16 miles NW of Goudhurst, and 17 miles W of Maidstone. With its easy rail and road access to London and its leafy atmosphere Sevenoaks has come to epitomize the essence of the commuter belt in many people’s eyes. This perception is not far from the truth but far enough away to reveal a genuine community with its own sense of history and identity. The leafiness is not that of a garden city creation, designed to soften the effect of wide-scale residential and commercial development. Instead it is a testament to the wooded countryside which formed the backdrop of this settlement some nine centuries ago. It is believed that there was a settlement on this site in ancient times but the first recorded mention came in AD 1114 when a record of local churches listed it as “Seovenaca”. Local tradition has it that the name refers to a clump of seven oaks that once stood here, long gone but replaced – with much fanfare – by seven trees taken from Knole Park and ceremoniously planted on the common on the outskirts of town in 1955. These replacements gained national headline status in 1987, when they suffered badly during the Great Wind of October. The rural feel of Sevenoaks – struggling against the odds – parallels the story of those trees. Despite the commuter tag which it must bear, Sevenoaks still has the appearance of a country market town, and it holds weekly cattle and produce markets not far from the station. A number of traditional Kentish tile-hung cottages, as well as a fine Regency pub and some grand houses, still line the main street before it assumes a more anonymous aspect. Not far from the center of Sevenoaks, however, are further reminders of the town’s heritage. The Vine cricket ground lies on a rise to the south of the town center. It was given to the town in 1773 but the first recorded match at the Vine between Kent and Sussex – took place in 1734. It witnessed a remarkable match in 1782 when the Duke of Dorset (one of the Sackvilles of Knole) and his estate workers defeated a team representing All-England. The victory was particularly sweet because the Duke’s team also won a bet of a thousand guineas. The pride of Sevenoaks, and of Kent itself for many people, is of course Knole House, the huge manor house set in extensive parkland. It is one of the largest houses in England, with 365 rooms inside its foursquare structure. The present house stands on the site of a much smaller manor house which was bought by the Archbishop of Canterbury in 1456 and used as an ecclesiastical palace until 1532 when it was taken over by Henry VIII. 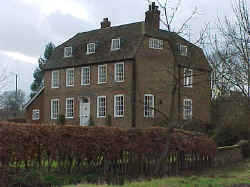 Elizabeth I granted it to the Sackvilles, who still live there although the house is now owned by the National Trust. Impressive in its scale, Knole House also offers visitors the chance to wander past outstanding collections of tapestries, antique furniture and an extensive art collection which has masterpiece by Gainsborough and Reynolds. The great house is not without its sense of human involvement. The Sackvilles proved to have the flair for employing the best craftsmen to realize their creative architectural spirit. The writer Vita Sackville-West was born in Knole House in 1892; some five decades later Hitler intended to use it as his English headquarters. Surrounding Knole House is its majestic deer park, covering some 1000 acres of rolling countryside with dense beech woodlands giving way to hidden dells. Source: Sean Connolly, Ed., The Hidden Places of Kent, Travel Publishing, Ltd., 1998., page 30-32. Sevenoaks, a market town and parish in the hundred of Codsheath, lathe of Sutton at Hone, county of Kent, containing, with the chapelry of Riverhead, and the liberty of Weald, 3942 inhabitants, of which number, 2114 are in the town, 17½ miles W from Maidstone, and 24 miles SSE from London. 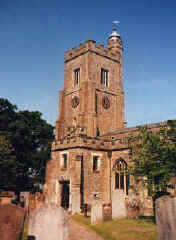 This place, which in the Textus Roffensis is written Seovan Acca, is supposed to have derived its name from seven large oaks which stood upon the eminence on which the town is built: the period of its origin is uncertain, and the only historical event connected with it is the defeat and death of Sir Humphry Stafford, by Jack Cade and his followers, when sent to oppose the rebels by Henry VI, in 1450. The manor, formerly an appendage to Otford, and as such belonging to the see of Canterbury, was conveyed, about the time of the dissolution of the monastic establishments, by Archbishop Cranmer to Henry VIII, and it subsequently became the property of the Dukes of Dorset. The town is situated on the ridge of hills which crosses the county, separating the Upland from the Weald, or southern part, near the river Darent, in a fertile and beautiful part of the country. In the reign of Queen Elizabeth the assizes were held in the ancient market-house, near the middle of the High-street, and also two or three times at subsequent periods.